55-56 VINTAGE AIR Complete air conditioning kit, Center Vent - replace orig. 55-56 VINTAGE AIR Four Vent Complete Air Conditioning Kit - replace orig. 57 VINTAGE AIR Complete air conditioning kit, Center Vent - replace orig. 57 VINTAGE AIR Four Vent Complete Air Conditioning Kit - replace orig. NOTES: 1. This kit requires an OEM, deluxe 4-lever control panel (Not included). 2. This kit is designed for the original firewall and dash. 3. Refrigerant lines are routed through the core support, and the drier mounts behind. These kits may be upgraded to include our popular polished ProLine compressor/alternator bracket. 4. 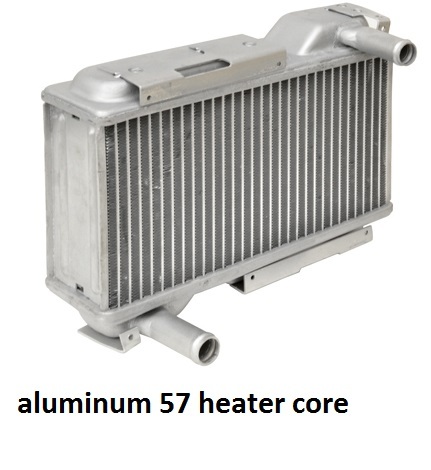 If using a cross flow radiator, see Condenser Kit # 03455-VCC. 5. Some installations may require additional engine pulleys not included with kits. You must provide pulleys, V-belts, heater hoses and refrigerant. 6. When retaining the original 265 or 283 V8 engine, it may be necessary to upgrade the harmonic balancer and pulleys. You will also need to upgrade from the generator to an alternator. 7. SureFit™ systems may interfere with some OEM radios or in-dash speakers. 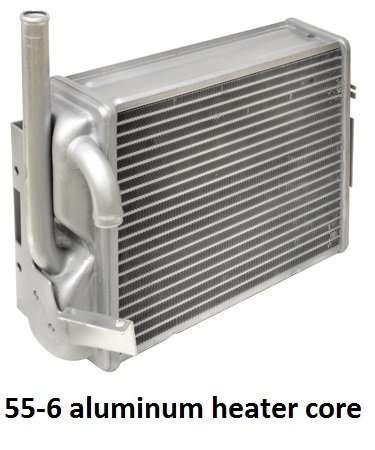 All002 Aluminum radiator 1 1/4"